At one point or another, most otaku will feel the urge to learn Japanese. For me, that happened five years ago, and at the time, I longed for a way of making the language fun, as I'm not a natural linguist. Manga University, publishers of the popular How to Draw series, have answered the prayers of language learners everywhere by creating Kana de Manga. 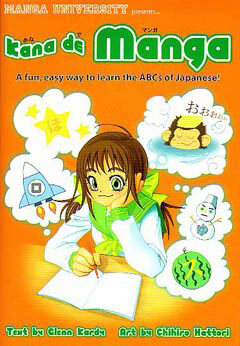 Combining cultural notes with manga-style drawings, Kana de Manga is designed to teach the two basic syllabaries that consist of written Japanese, collectively known as kana: hiragana, a cursive script normally used for Japanese words and by children who don't know many kanji, and katakana, an angled script commonly used for foreign words. After a comprehensive, four-page introduction covering the essentials of usage, pronunciation and stroke order, the book itself covers the main fifty sounds used in Japanese. The left hand page is devoted to hiragana, while the right side teaches katakana. Each page has the sound written out, a word to show its usage (written in both English and hiragana or katakana), the pronunciation of the word, and a definition, along with a relevant black and white picture. These pictures, all drawn by Japanese manga-ka Chihiro Hattori, can be humorous, as in the case of nureru (to get wet). The artwork can also be cute (moppu -- mop), artistic (yosei -- fairy), or just stereotypical, as in the example for hoshi (star), which shows a young girl and boy sitting with their backs to the reader, gazing at the stars. An added bonus is the four boxes located at the bottom of each page that not only show the stroke order (which is very important in Japanese, especially when it comes to kanji), but also an outline and space for you to practice your kana handwriting. The nice thing about this book is the cultural information, which is not only relevant but memorable, serving as an aid for the learning process. For example, if we turn to the hiragana page for the sound mi, we discover the word miko or 'shrine maiden.' Along with a picture of a young Japanese girl in traditional garb, which will be familiar to fans of Rei Hino from Sailor Moon, there is also a definition, informing us that miko were young girls who act as messengers of the gods who often had mysterious abilities. Despite being a thin book, Kana de Manga is a typical tankouban in terms of size and compactness. Six pages of squared grids are provided in order for the reader to practice writing kana. The first and final pages of the book are made of cardboard, containing grids that set out the Japanese syllabary in hiragana and katakana, along with the twenty-five modified sounds, such as bu, ga and ji. The easy-to-read style of Kana de Manga sets it apart from most language textbooks, and at just under ten dollars, this is a book that everyone interested in learning Japanese should have on their bookshelf. It is an ideal book for any otaku who wants to learn Japanese, and it also provides a foundation for the next books in the series, Kanji de Manga, which concentrate on teaching kanji, the complex characters which form the final script in the Japanese language.